Spa Francorchamps is one of the few tracks on the current F1 calendar with a true rural location, some distance from the closest major cities. For that reason, it makes a lot of sense to camp near the circuit. Driving is probably the most convenient way to get to the circuit, but trains and buses are also available. All images © f1destinations.com. 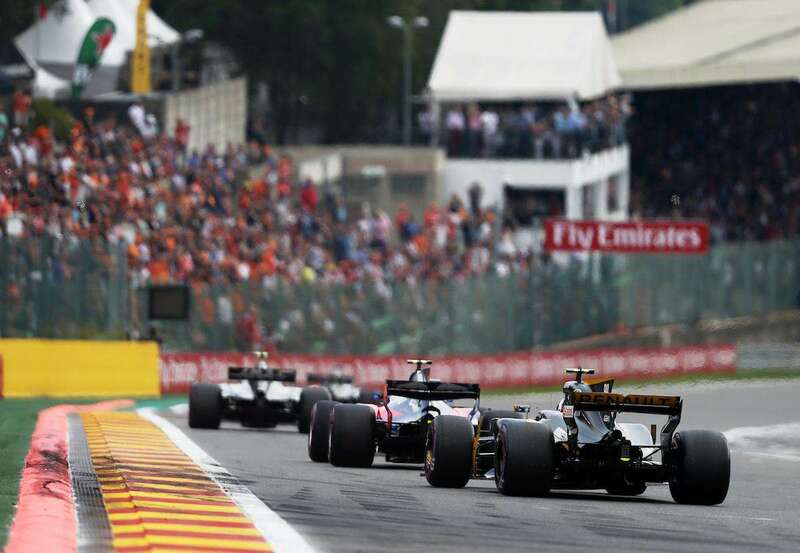 The Editor attended the 2018 Belgian Grand Prix. Maastricht Aachen Airport (MST), 80km from the circuit: limited seasonal connections to Alicante, Barcelona and Bari. Luxembourg Airport (LUX), 110km south of Spa: Luxair, the flag carrier of Luxembourg, flies to 20+ destinations in Europe. In addition, there are flights with British Airways (to London Heathrow), Easyjet (4 routes), KLM (to Amsterdam), TAP (to Lisbon) and more. Brussels Airport (BRU), 140km west of Spa: a major international airport serving most European routes, plus destinations as far afield as the Middle East, Asia and the USA. Brussels South Charleroi Airport (CRL), 140km west of Spa: an important hub for Ryanair, which flies 50+ routes from all over Europe to CRL. Wizz Air also serves the airport with around 10 routes to Eastern Europe. If you want a better selection of flights and don’t mind a longer drive to the circuit, it’s also worth considering Dortmund Airport (225km north east of Spa), Amsterdam Schipol Airport (285 km north of Spa), Frankfurt Airport (300km east of Spa) or even Paris Charles de Gaulle Airport (400km west of Spa). 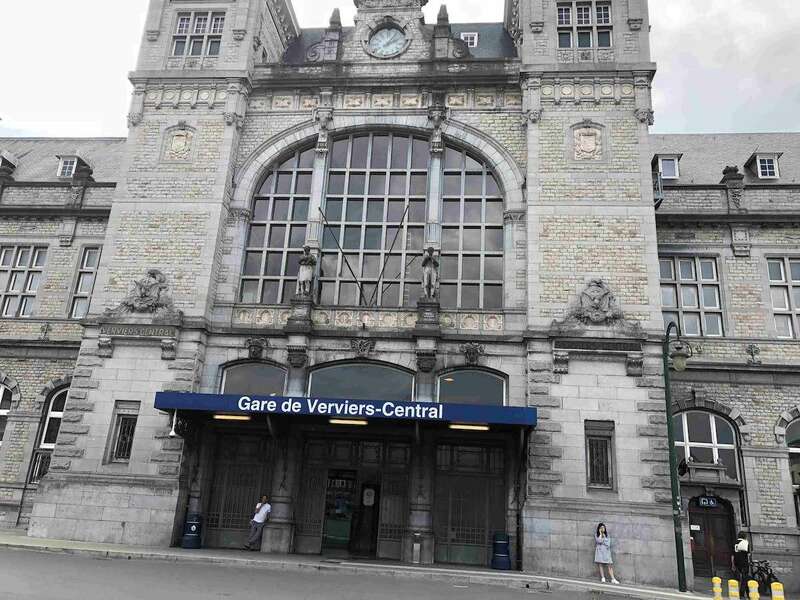 If you choose to stay in one of the larger regional cities (Aachen, Brussels, etc) and take the train to the circuit each day, you’ll need to buy a ticket for Verviers Central station, the closest major train station to Spa Francorchamps. 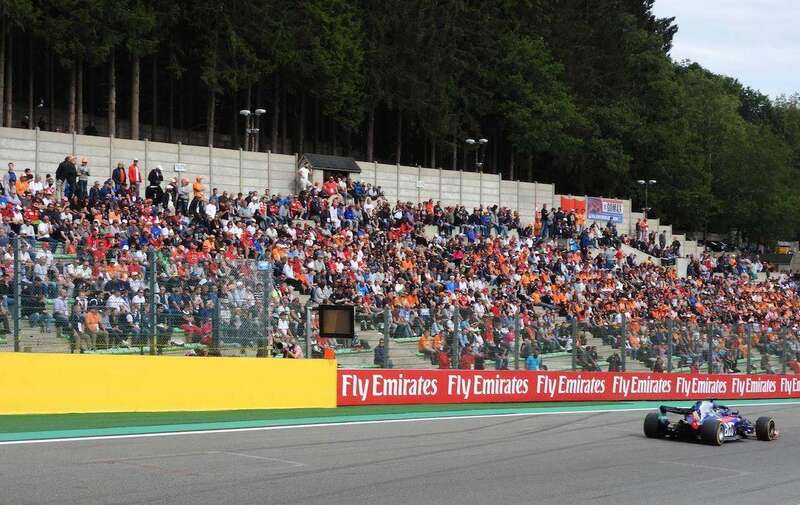 Shuttle buses from Verviers to Spa (bus 294 or 395) run regularly on race weekend with a journey time of 45 minutes. Trains from Luxembourg stop at the Trois Ponts station, from where you can take the 294 bus to the circuit (40 minutes travel time). Click here for more information on getting the train/shuttle bus to Spa. Sample train travel times (not including 40-45 minute shuttle bus): Liege (BE) to Verviers : 20-30 mins / Brussels (BE) to Verviers: 75-120 mins / Charleroi (BE) to Verviers: 100-160 mins / Maastricht (NL) to Verviers: 70-75 mins / Cologne (DE) to Verviers: 80-105 mins / Luxembourg (LU) to Trois-Ponts: 90 mins. Click here to hire a car with our partners Rentalcars. 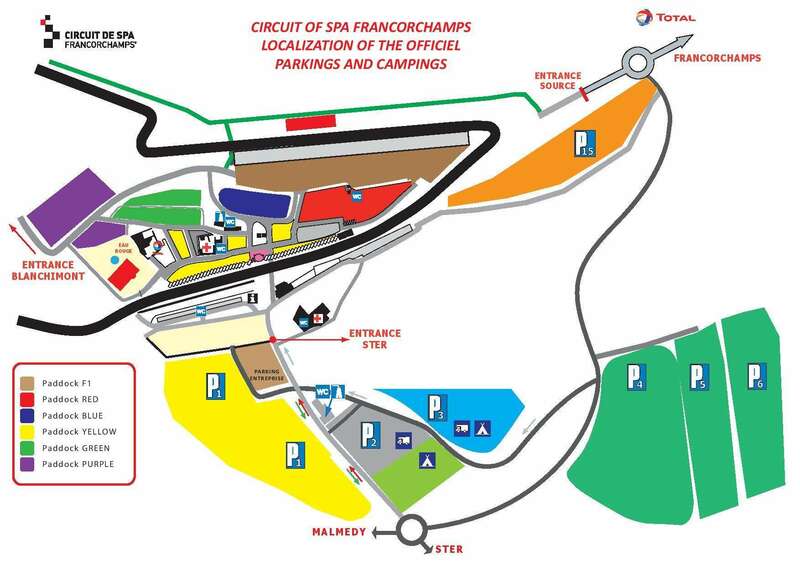 Spa Francorchamps is close to the E42 motorway, which connects to a network of other major roads and big cities in the region. Make sure you have GPS or navigation on your smart phone. The small country roads near the circuit are well signposted and local police control the circuit access roads over the weekend. Remember that traffic gets progressively worse as the weekend progresses so take it easy and try not to drive at peak times. Don’t forget to buy a parking sticker in advance for one of three main car parks next to the circuit. We recommend the Yellow area between the Ster and La Source entrance gates for €16 per day. The closest ferry for fans driving from the UK is the Dover to Dunkirk, which costs around £90 including two adults and a car on Grand Prix weekend with DFDS. Click the images above for Spa parking map, local access road map and Belgium driving map. If you have purchased special Sunday-only tickets, then you are entitled to FREE bus travel on race day to/from the following regional cities: Brussels, Charleroi, Namur, Wommelgem, Brugge, Leuven, Gentbrugge, Mons, Maastricht, Liege, Aachen and Luxembourg. Click here for more details, including departure times and meeting points in each city. Any tips on getting to Spa? Leave a comment below! Dear Andrew, we are father and son going to the Belgium Formula One, our first race ever. We will arrive by plane and land in Dusseldorf, hotel in Aachen. However we still need to plan the transfer after the race in Spa to the Airport in Dusseldorf on Sunday. I would like to book a taxi which could collect us after the race and drive us directly to the airport. Please do you know which companies which we could contact to book this transfer ? we are coming to the F1 next month and camping there, we are bringing our bikes is there a path we can ride around the outside of the track and stop at different points. Hi Sharon, there isn’t a specific path around the outside of the circuit, but you will discover plenty of local lanes and roads to explore. It’s also worth reading up on the Ravel network of bike paths in the region. If cycles are allowed into the circuit this year, then there are paths between all viewing areas within the circuit. Hi we’re driving from Hasselt for Saturday and Sunday do we need to pre book parking? Sorry for the slow reply. Purchasing parking is recommended, though there are additional parking spaces in Francorchamps and other areas you can use. Hi, I’m studying in Aachen and I got a bronze ticket for Sunday. Can I use the “Mobility solution” too? Even If I bought the ticket from the F1 store and not from the Spa circuit web page? Hi Max, yes I think you can take the bus on Sunday. We will be taking the bus on Sunday from Leige. Are there any issues with the busses filling up and not being able to take all the people? Hi, I recommend buying your parking ticket from the official website before you travel. Cost is 16 EUR per day. Yellow area is close to La Source and good for most grandstands. Hi, I am going to the Belgian GP (staying in Aachen) and getting the train to Verviers then the 294 bus to/from the circuit. Do you know if the are as regular on the Thursday for the pit walk? Having been at Monza the last few years the Thursday always is a bit tricky for travel it seems. Does anyone know, if I bought my Sunday only ticket, but from tickets.formula1.com, not from spagrandprix.com, do I benefit from free transportation? Hi I am surprising my husband for his 30th with our first ever GP, in Belgium this year, we are staying in Brussels and have a full weekend ticket. As this is a surprise I am researching everything myself, I need advice on the different ways to get to and from the track, what time we would need to set off to arrive in time. Are there any coaches or transfers from Brussels direct to the track set up for the race weekend? Also if you have any idea on cost on all of the above it would be greatly appreciated. Hi Sara, whatever way you choose, it won’t be a quick trip from Brussels to Spa, as it is a distance of 150km. Personally, I would hire a car for the quickest commute (under 2 hours), but understand this may not be the preferred option for everyone. Next best bet is to take the train from Brussels to Verviers, then the shuttle bus to the circuit, but this could easily take 2-3 hours each way. We are doing the same, staying in Brussels and traveling each day. Plan to see how this goes on the Saturday and if too arduous hire a car. Hi, I am going this year 2018 with my son and staying in Brussells any help would be appreciated on the best way to get to Spa? 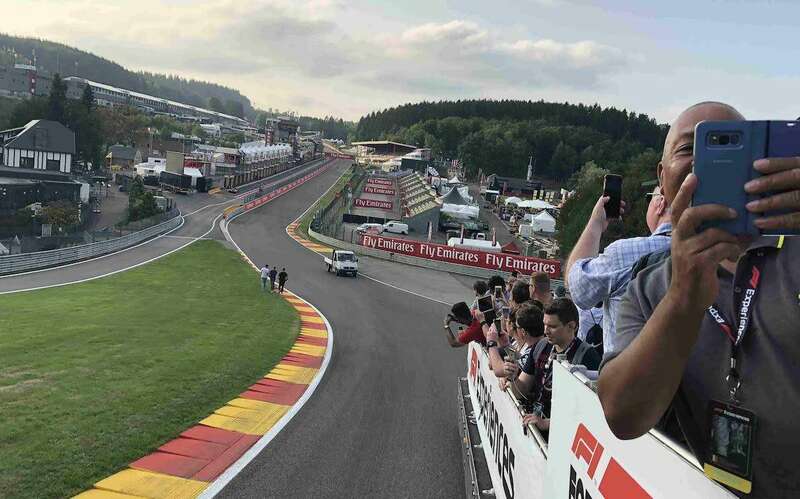 If you are going for the whole weekend, I suggest hiring a car to drive from Brussels to Spa Francorchamps (150km should take less than 2 hours each way, but stay around a few hours extra after the race on Sunday, or you will hit huge traffic). If you are only going on race day, there is a bus service from Brussels, which is free if you purchase your tickets direct from the circuit. Thanks, We are going for the Friday, Saturday and Sunday. I have never driven abroad before and my son is only 18 and hasn’t been driving long. I am not sure how I would cope. Hello i would like to ask you about the bus that you said. Is it free?and how can we book a seat only for sunday? Hi Sara. I am doing the same this year. Any tips re transport, especially getting back to Brussels? We are staying in Recht south of the circuit. Which is the best car parking? Hi, it depends a little on where you are sitting at the circuit. The Yellow area is best for most grandstands but the Green area looks convenient from Recht. Take the N660 and then E42 roads (15km, approx. 15 minutes) and then take exit 11 for the Green parking entrance. The Green area is at the top of the circuit near the Les Combes entrance. Click here to check the map. Buy parking tickets here. I brought my ticket from the official site, however never saw any option to add the ‘mobility solution’. Will I be ok to get on the coach with only the tickets to the event? You should be ok, provided you have Sunday-only tickets. Hi im leaving on Sunday morning, catching the ferry from Dover to Dunkirk, i get into Dunkirk at 9AM approx, will this leave enough time to drive to the circuit? Any other tips / ideas on how to get to the race circuit? Have you checked if there is a replacement bus service? Sorry, I don’t have more information. We are flying into London, then looking at getting a connecting flight to Belgium, staying at le Domaine des hautes Fagnes. Which airport is best one to fly into, and best way from that airport to hotel ? Hi Richo, I’d say you are best flying from London to Cologne Bonn (CGN) airport. I see plenty of cheap direct flights with Ryanair from London Stansted (STN) to CGN. When you arrive, the easiest way to get to your hotel will be to hire a car. The alternatives – train etc, will be time consuming and not direct. I am looking at camping at Spa this year. Is there a shuttle bus from the campsite to the race circuit or do we have to drive there? Hi Jennifer, it all depends on which campsite you are staying! You can walk from the official ones closest to the track. I would be leaving my car at the campground, it doesn’t make sense to drive, given the high amount of traffic around the circuit. Some campsites may offer shuttle services, but I am not sure. You can always just hitch a ride. I drove to the circuit a few years ago and was happy to pick up some fellow fans walking near the circuit! Yes, there is a race-day bus from Maastrich, info here. I suggest you contact the promoter for more information about the bus. Hi, I’m planning on staying at a campsite in Stavelot from Thursday to Monday of the Grand Prix weekend. Could anyone advise how’s best to get to Stavelot from Brussels (without as car)? Would there be a train, or shuttle bus on the Thursday from Verviers or Spa? Hi how far to drive from Liege to Circuit page, ease. Hi Lynn, it’s about 60km on the motorway and should take 40-60 minutes. But expect delays on race weekend, especially leaving the circuit on Saturday and Sunday. Here’s the best route: Google Maps Liege to Spa Francorchamps. Hi Andrew, we are two advanced police driving drivers, father and son looking to travel from Cardiff to this years Grand Prix in Spa.We can either travel by Eurostar on Friday 24th and return on Sunday 26th after the race or drive from Cardiff to race on same days as Eurostar.We can return on Monday 27th if more suitable. We would prefer to stay in a good 3/4 * Hotel,with two days easy access to Saturday and Sunday,probably will book bronze tickets,your advice and help will be much appreciated. Hi Dave, I’d be inclined to drive your own car, especially as you want to stay in a decent hotel. You will probably need to be in a neighboring town (look on Booking.com for example) and then drive to the circuit and back each day. I definitely recommend staying on Sunday night, otherwise you will be stressed after the race trying to get out of the circuit at the peak time. Hi Andrew, I’m hoping to head to Spa this year with a Bronze ticket and take pictures all three days. That ticket doesn’t give me access to grandstands of course, but can I still get close to grandstand areas, such as Eau Rouge and La Source? Don’t worry, you’ll still have plenty of spots to take some good pictures. I’ve described some of them in my 2015 Belgian GP trip report. 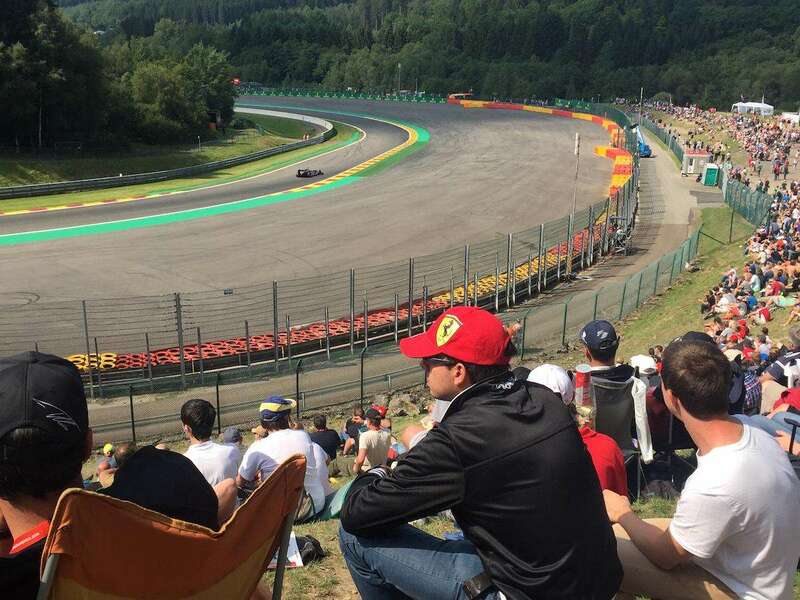 Honestly, I prefer General Admission at Spa > but a seat is probably a good thing to have for race day, as I know it’s getting busier and busier each year. Do you think it we be possible to catch a flight on departing Sunday evening at 8pm from Brussels Airport after the race ? Would it be best to hire a car in that case? Does anybody know what time the buses get back into the city after race ? Hi Jim, that flight is too early. Even if you hire a car, you will probably need to leave as soon as the race finishes, and you’ll be stressing all day about missing your flight. Better to book a flight no earlier than 10pm and take your time leaving the circuit. I don’t know exactly when the buses get back, sorry, but it’s going to be around a 2 hour trip from the circuit to Brussels, not taking into account the traffic leaving the circuit, which could add 1-2 hours to this. Hi Jim, just wondered what your travel plans are. Our flights are 10pm on Sunday from Brussels and I’m stressing now. We’re taking train & shuttle bus but now thinking we may have to leave before race finishes. Did you make it Hazel? My girlfriend and I are staying in Liege for the Grand Prix. We’d like to take the train to Verviers then the shuttle bus. But alternatively could rent a car too. Do you know how frequently do the shuttle buses run from Verviers to the circuit on Saturday and Sunday? And are they likely to fill up? Hi Tim, sorry I don’t have personal experience of the shuttle buses. I’d prefer to just rent a car, but you need to be patient – especially leaving the circuit on the weekend. I stayed in Liege last year and just got the train to Verviers and then the shuttle bus. After leaving around 8ish on Saturday, it was horrible getting to the track, so we left at 6am on the Sunday and it was absolutely fine, no problems, barely any queuing. The shuttle buses are fairly regular, the ones outside the station you have to pay 10 euros for I think. They leave as soon as they’re full up. Hi Paul, useful info. Thanks. We’re first timers at Spa and will be taking the same route and did wonder what time to leave Liege. What about the return from circuit to Liege? Where’s the pick up and any tips to avoid the mad traffic on the return that I’ve been reading about? Thanks! Hi going to stay at the yellow campsite this year and was hoping to cycle to the track ( la source entrance) do you know if there is anywhere to park cycles here? Hi. I’m thinking of buying the bronze ticket for sunday with mobility solution and we will be staying in Liegé. If i’m understanding it correctly the mobility solution is both a coach TO the track and also FROM the track once the race is over, right? a) I’m travelling over from New Zealand to attend Spa this year. I’ve got a rental car and am on the channel train arriving 7am at Calais. Is this going to give me plenty of time to settle in at the circuit for the Saturday? Just wondering how painful the journey is from Calais to Spa?? I’ve purchased a yellow parking ticket near La Source. b) I’m staying over in Durbuy. It says 50mins to the circuit for the Sunday. I guess I can expect a much longer commute, but do you know how long? My tickets are near Eu Rouge. Hi Matt, you should be fine on Saturday morning. It’s pretty much motorway all the way from Calais to Spa and you will be arriving after most fans. My advice would be to not be in a hurry leaving the circuit on either Saturday or Sunday. There will be lots of traffic, and it doesn’t make sense to leave when it’s at the worst. Hi, I’m staying in Spa town about 4.5 miles from the circuit, I’m traveling by car but is there any shuttle buses on all 3 days or am I best using the car? What would be the best way via public transport to get to Spa bus station from the Youth Village campsite? Hi…Staying at the yellow campsite Fri-Monday and will be walking to La Source as this seems to be closest and most convenient, do you know how long a walk it is and if shuttles run between the two? We are attending Spa race next month. Have read almost every site on the shuttles etc. We’re staying in Liege and had originally planned to take the train to Verviers daily and then the 294 or 395 buses to and from the circuit but have read some horror stories about people getting stranded after the race and having to wait hours to find a taxi and pay huge sums. This mobility solution sounds great however we are going for the whole weekend (not Sun only). Its bizarre that they would offer the service for a “Sun only ticket”. Or maybe they’re not describing it correctly and mean to say that the Mobility buses only run on Sunday and you’ll have to make other arrangements for Fri/Sat. Otherwise then I’m buying a weekend ticket as well as a Sunday only……Someone didn’t think that one through every well. We’ll be for first time on F1 race this year with my husband. I was wondering is there any place close to/in the circuit where we could leave our luggage on Thursday for the pit lane walk ? We’ll arrive in Cologne, I was thinking to take a train directly to Velviers in order not to miss the pit lane walk but where to leave our luggage for these two hours? I saw that in Velviers train station there is no place to leave the luggage… Thank you! Sorry, I don’t know of any place to leave your luggage for the pit lane walk. 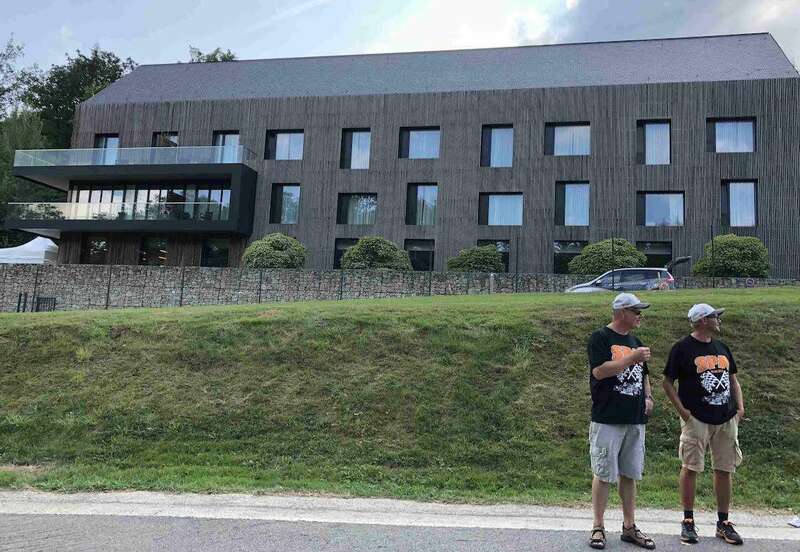 Perhaps you could ask the Hotel De La Source about this? Hi i bought a Sunday only bronze ticket. Can anyone avail of this free bus or do you have to get a special mobility ticket? I’m pretty sure you can use the free bus, but I would call the ticket company where you bought the ticket just to be sure. Dear Andrew, I am from Brazil and this is my first time in Begium. I am going to attend the Spa GP Formula 1 and will stay in Ghent. Could you please let me know how can I get to the race by bus? I am staying in Brussels and travelling on public transport to the track in Saturday and Sunday. The bus timetable suggests there is only 1 bus back to Verviers and this leaves at 6. Is this accurate? I can’t see how everybody will fit on 1 bus,!! Hello, this will be my first tiee in Spa, i have a silver 3 ticket but i have no possibility to buy a parking ticket. Are there other parking areas where we can park? Or can we buy a parking ticket at the entrance of the parking? I think the easiest would be to get a large car or private taxi that can take you all. Cheaper, but more time consuming, would be to take the train from Brussels to Verviers each day, followed by the shuttle bus to the circuit. Hi. Is there a place close to the track we can stay with a campingcar? Hi Geir, the short answer is yes! 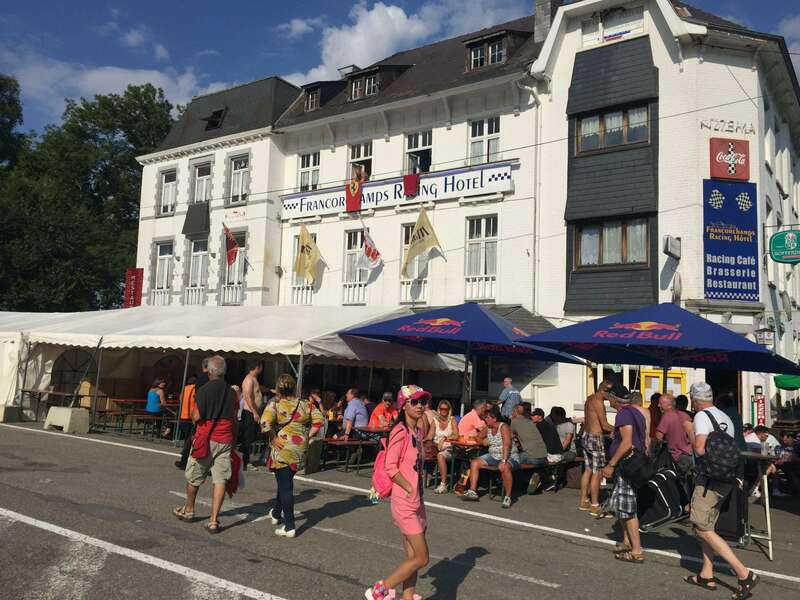 Please read our Accommodation guide – plenty of campsites near Circuit de Spa-Francorchamps for campervans, both temporary and permanent.